Nothing screams �summer� like fresh-picked blueberries and their rich, deep blue hues. At Hawaiian Shaved Ice, we scoured the country for the most authentic and delicious blueberry flavor and bottled it to create our very own blueberry snow cone syrup. Now you can create delicious treats that are perfect for a summer afternoon or even a cold winter day when you�re craving summer flavors. 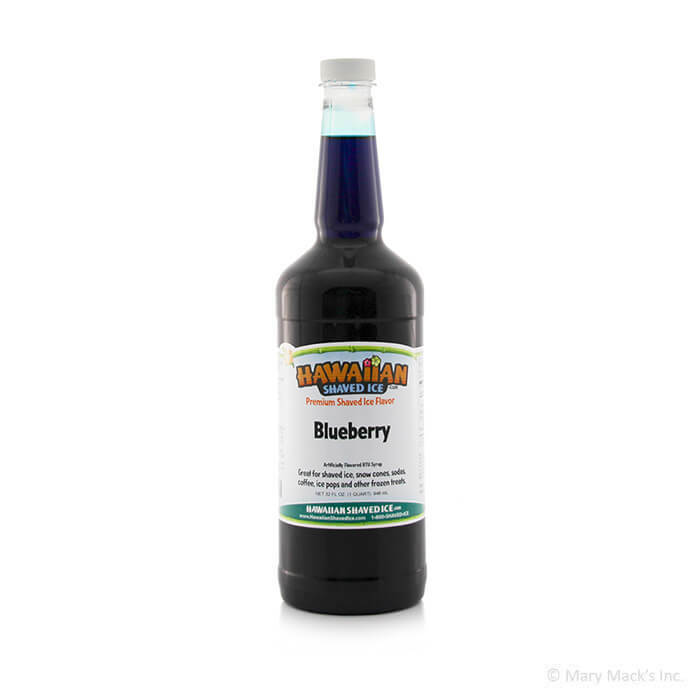 At Hawaiian Shaved Ice, blueberry snow cone syrup is one of our most popular products. It�s incredibly authentic flavor makes it a must-have for any snow cone maker. This blueberry snow cone syrup will wow your friends and family at your next gathering or event. Purchase Hawaiian Shaved Ice blueberry syrup in an individual quart, gallon size container, or as part of a multi-pack of snow cone syrup flavors. Pair this blueberry snow cone syrup with black cherry, strawberry, banana and other popular flavors for plenty of fruity fun.